The Rocky Mountain Chocolate Factory features an extensive line of premium chocolate candies and other confectionery goodies including gourmet chocolates, handmade caramel apples, and creamy fudge. Rocky Mountain Gourmet Chocolates - For the Peak of Perfection in Handmade Chocolates, Rocky Mountain Chocolate Factory delivers with every order, featuring batches of homemade boxed chocolates, gourmet chocolate bars, creamy fudge, cocoa and even sugar free chocolatey treats for those with special dietary restrictions! Gifts for all Occasions - Whether you want to say Thank You, Happy Birthday or Happy Anniversary, their handmade chocolates come in elegantly packaged boxed chocolate varieties suited for every taste including chewy caramels, nutty clusters, exotic truffles, crispy toffee, dark chocolate, mints and more! Amazing Caramel Apples - How about them apples? The Rocky Mountain Chocolate Factory brings you more than just mouth watering gourmet chocolates! Bite into an old fashioned caramel apple smothered in thick and chewy handmade caramel dipped in your choice of yummy toppings from M&M�'s to English Toffee, Pecans and more! Handmade Fudge - Once you've stocked up on an assortment of flavorful Rocky Mountain chocolates, stock up on some Rocky Mountain fudge that is just as creamy and delicious as their boxed chocolates and gourmet chocolate bars, made from the freshest and most wholesome ingredients! 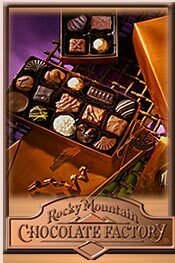 Click here to find a Rocky Mountain Chocolate Factory store near you!